Sir Richard Branson; businessman, entrepreneur, founder of the Virgin group of companies and participated in some hilariously stupid publicity stunts, is one of the richest people in the UK and pretty high on the world richest list too. His empire started with Virgin Records and now includes a bank, an airline company and, almost, a space tourism business. Here are ten facts about Sir Richard Branson that you just may not have known. Branson didn't do too well at school, partly because he has dyslexia. He has, apparently, worked hard to overcome this and most people don’t even know that he’s dyslexic. His headmaster told a young Richard Branson that he’s either end up being a millionaire, or end up in prison. Despite the huge success of the Virgin brand, it hasn't all been plain sailing for Richard Branson. In 1992, Branson had to sell his Virgin record label to EMI to raise the funds needed to save Virgin Airlines. It is said that he cried when the sale was being made. OK, so you probably did know this one, but, it’s an interesting fact anyway! Richard Branson owns his own island, which I you have enough dosh you can rent it out for your vacation. One night on Branson’s Necker Island will set you back about USD 50,000. Although he has had some highly publicised record breaking attempt disasters, Branson did make the record books twice in a hot air balloon. In 1987 Branson was the first person to cross the Atlantic in a hot air balloon and, in 1991, he crossed the Pacific Ocean too, making him the first to have done both. Sir Richard Branson has made quite a few appearances on TV shows. He has appeared in ‘Only Fools and Horses’, ‘Friends’, ‘Baywatch’, ‘Birds of a Feather’ and ‘The Apprentice’, to mention but a few. Branson has already registered the trade name, ‘Virgin interplanetary’ in anticipation of a business that will sell real-estate on other planets. Mind you, he probably did this before the loss of his tourist spacecraft, VSS Enterprise, in 2104. It seems that Richard Branson is a bit of Start Trek fan too. He named the, ill fated, Virgin Galactic Spacecraft ‘Enterprise’ and, Star Treks Captain Kirk, William Shatner, had been invited to be a passenger the first of Virgins commercial space flights. 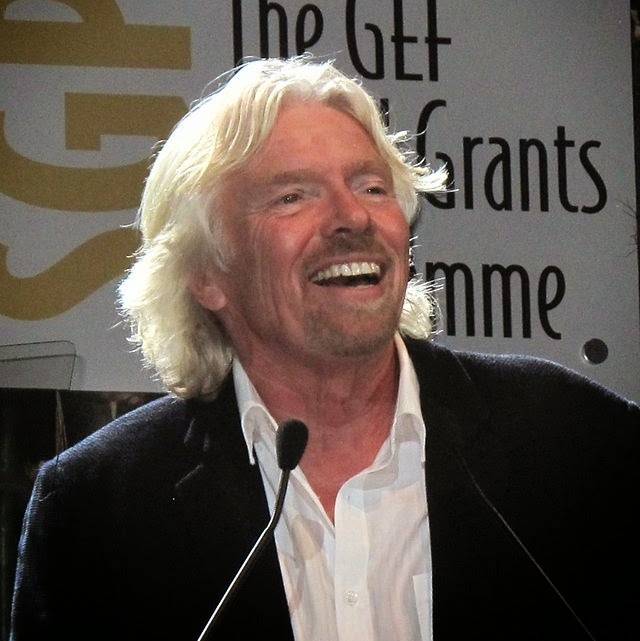 Richard Branson’s net worth was estimated to be USD 4 billion in 2013 and he is on the top five richest people in the UK. He was also ranked the 254th richest person in the world, in the same year. The billionaire entrepreneur has been married twice, His first marriage, to Kristen Tomassi, ended in divorce in 1979 and he married his second, and current wife, Lady Joan Templeman in 1989. Richard Branson has two children, Sam and Holly. Richard Branson is also an avid collector of vintage cars. He normally drives a range River, but his collection includes cars such as a vintage Morris Minor and a Humber Super Snipe.